When filling the sprayer with water, avoid any risks of over flow or return to the water source. At the same time, special care must be taken that no spillage could end up in drains, wells, ditches or surface water unless the filling takes place on a special concrete area with efficient drainage to a safe container. 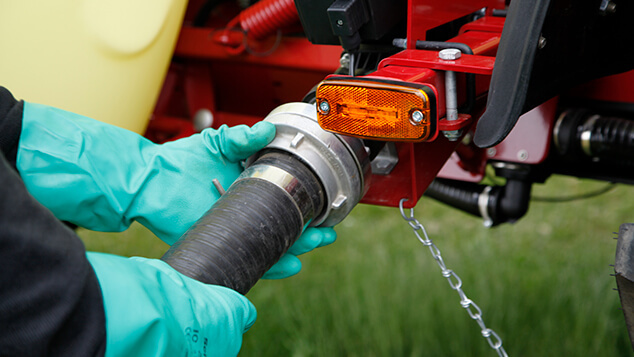 In practice it is safest to fill the sprayer from a separate water tank – or if filling directly from a public or private water supply makes sure that the end of the filling hose is positioned at least 10 cm above the sprayer filling hole. 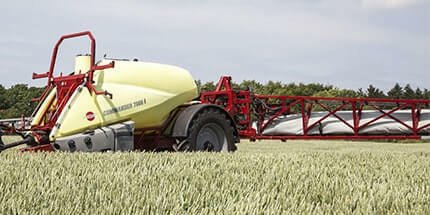 To avoid overflow or spillage, the sprayer must never be left unattended while filling. You should also check local statutes about filling a sprayer near water sources. To minimize the impact of smaller spillages or drips in the same spot, water filling should ideally be done in the field. If filling water at the farm, an area covered with grass is better than stones or gravel. The safest alternative is to carry out the filling under a roof and with drainage to a separate tank. Adding chemical should be done at varied places in the field. Transportation of concentrated chemicals to the field must be done safely and according to local rules. We recommend transporting chemicals in a locked box where possible, in order to contain any spillage that may occur. A shovel and plastic sack may also be a wise precaution, as they can be used to pick up any spillage of concentrated chemical. If adding chemicals at the farm, do so over a concrete area where it is possible to pick up any spillage using special absorbent granules. If this is not possible then fill over a dedicated grass area that will help degrade any spillage. 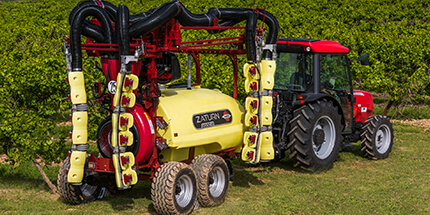 The sprayer pump should be off when transporting the sprayer from farm to field – to ensure the system is not under pressure. 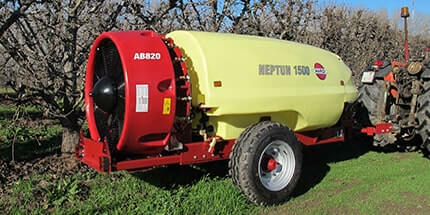 When a agrochemical container is emptied it must be rinsed with either the rinsing nozzle in the chemical filler or with 3 lots of clean water. In both cases it is important to move the container to make sure the rinsing is fully efficient. If using a ringing nozzle - the type used for rinsing a container - it must be adjusted to the container size and an extra rinse with clean water afterwards will ensure that the container is as clean as it can be. The rinsing water must be added to the main spray solution. 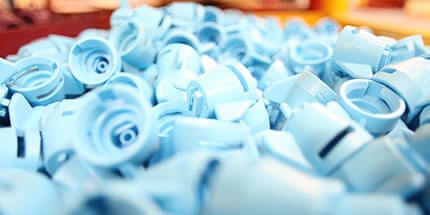 Rinsed containers must still be stored securely in a locked cupboard or compound until they can be safely disposed of. If a specific cleaning method is given on the label then this must be followed. Always remember to wear gloves, a face shield and plastic apron or appropriate waterproofs when cleaning. Sprayer cleaning actually begins when calibrating - if calibration is done correctly, there will be very little spray solution left in the tank after spraying. In some instances, small residual volumes of spray solution have been drained from the machine and disposed of by an authorised company. 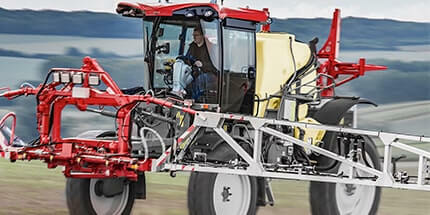 The emphasis today is on in-field cleaning, using dedicated equipment on the sprayer. Dilute the remaining liquid and spray this out over an area which would comply with its approved use and avoids exceeding its maximum dose. Diluted 10 times with water and sprayed out over the just-treated area or similar will often meet that requirement simply and effectively. 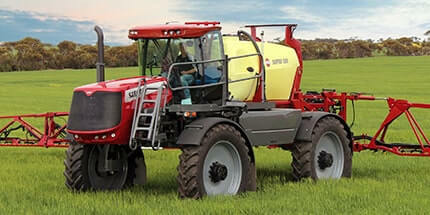 A dedicated rinsing tank mounted on the sprayer is vital for quick and easy field cleaning. To minimise the amount of rinsing water that has to be used and then disposed of, the tank is flushed internally using the equivalent of 10% of the tank size. This is repeated twice. 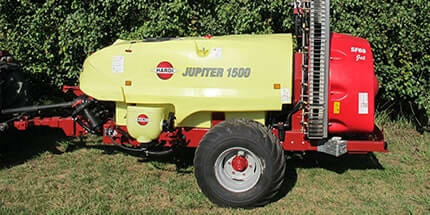 A high pressure cleaner is a useful help. After each rinsing stage, the rinsing water is sprayed over an area of low environmentally-valued vegetation that will not be damaged or, if ideally, the just-treated crop or similar. Before applying the rinsing water over the crop, all valves must be activated for a complete rinse. Do remember that whichever way you dispose of plant protection products, the procedure used must comply with your local rules and regulations. In particular, be aware that no rinsing water ends up in ditches, drains, waterways or wetlands. 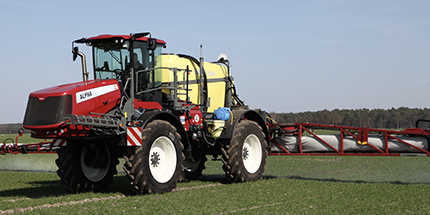 To be able to confidently treat crops that are very sensitive to the agrochemical that has just been used in the previous application, it may be necessary to chemically break down the smallest traces of active compound still stuck to the sprayer. Fill the spray tank with water and an approved cleaning agent like ammonia, bleach or a product marketed for sprayer cleaning. Turn on the pump and let the solution circulate through the whole system for 15 minutes. 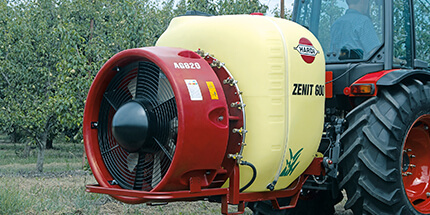 Do operate all valves – on sprayers with self cleaning filter increase the pressure until the safety valve is activated, then reduce the pressure again. To ensure the tubes and hoses on the boom are also cleaned remember to let the nozzles spray onto grassland or the just-treated crop for a while during the process. 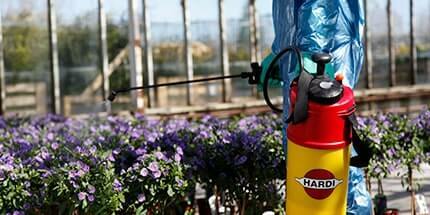 Leave the sprayer for a couple of hours to ensure that any residues of chemicals are de-activated. 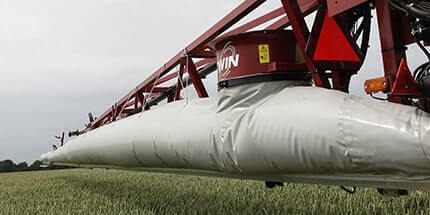 This cleaning solution may be sprayed over the just-treated area or grassland. Dismantle and remove all filters and nozzles and place them in a container of the same cleaning solution as used in the spray tank. After a while they can be given a final clean with a brush and rinsed with clean water, then fitted back on the sprayer. 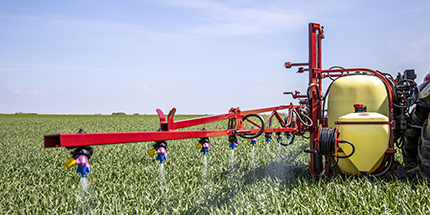 Finally the whole sprayer should be rinsed with clean water that is also sprayed over the just-treated crop or grassland – somewhere with vegetation where it does no harm. Fill the tank to 1/10 of its capacity with water and cleaning agent. Activate the rinsing nozzle and let the liquid circulate in the whole liquid system for 15 minutes whilst operating all handles and valves. Then follow the procedure as described for 'Cleaning without rinsing nozzle'. Plan ahead for any emergency and try to anticipate problems. For example, if the wind speed is currently acceptable but is forecast to rise then consider spraying the downwind swath edges first. 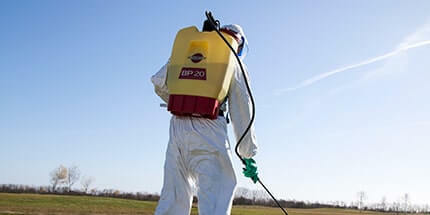 Escaped spray liquid will soon apply a huge excessive dose that can also contaminate water within the soil or adjacent to it – or cause a sterile area of soil to be formed that will remain for many years. 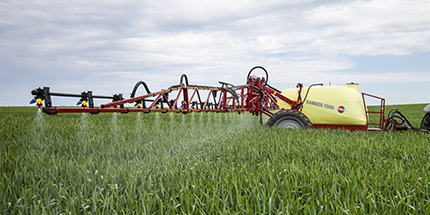 Avoid over spraying - it is wasteful, poses a potential hazard, and puts your crops at risk. Use the boom section valves to treat narrow areas accurately. If treating an 'angled' field it is worth taking the time to turn boom sections on and off as the boom passes over previously sprayed areas. 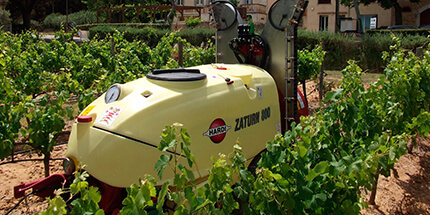 HARDI TRIPLET nozzle bodies have an ‘off’ position that can also be used to control swath widths by 0.5 m sections. 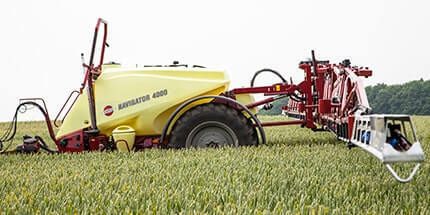 An area covered with low value, unused grass may be an appropriate 'filter' for distribution of rinsing water from the sprayer and an appropriate place to clean the outside of the sprayer and tractor. The grass hinders the agrochemical solution from moving away and encourages it to be chemically bonded to soil particles pending subsequent degradation. Therefore it is advisable to have such an area - moved every year - near your farm buildings. 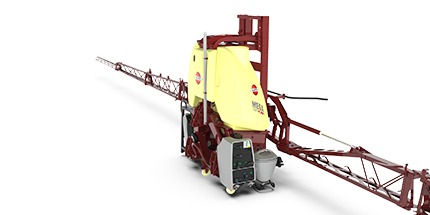 Another possibility for most sprayers involves installing dedicated equipment for external cleaning of the sprayer in the field. This preferred procedure is still being developed but some of the clean water in the dedicated rinsing tank has to be reserved for this extra purpose. 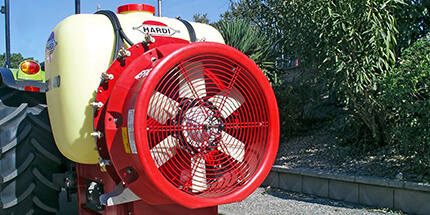 High pressure hoses are used to rinse those areas of the machine that get the greatest level of contamination - the rear of the tank, the booms and wheels. The frequency at which external cleaning takes place will depend on factors such as spray quality and wind direction, as well as exposure time and temperature. Evidence suggests that infield cleaning should be done at the end of every spraying day. 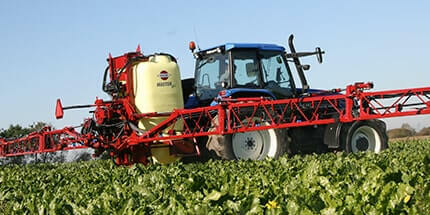 It is an important activity for both personal and environmental safety when storing the sprayer.